STM29 photographers are honored as Chicago Journalists of the Year. Photo by Ernest Torres. Almost exactly four months after getting fired, several of the fired Sun-Times Media photographers (STM29) returned to the same building where they fired to receive accolades as Chicago Journalists of the Year by Chicago Journalists Association (CJA). “This room is uncomfortably close to where it happened in May,” STM29 photographer Jon Sall said. Collectively, the STM29 had more than 613 years’ photojournalist experience when they were abruptly fired. “These men and women are being honored for their exemplary documenting of Chicago area events,” said CJA President Allen Rafalson. Sun-Times Media laid off 28 photojournalists from the Chicago Sun-Times and its affiliate news publications on May 30. Photographer Jon Sall was fired in mid March, about two and a half months before the rest of the department. The STM29 are: : Steve Buyansky), Richard Chapman, Tom Cruze, Tom Delany, Rob Dicker, Stephanie Dowell, Matt Grotto, Rob Hart, Brian Jackson, Andy Lavalley, Michelle Lavigne, Curtis Lehmkuhl, Matt Morton, Joseph Meier , Dom Najolia, Andrew Nelles, Jeff Nicholls, Buzz Orr, Ryan Pagelow, Al Podgorski , Brian Powers, Brett Roseman, Larry Ruehl, Jon Sall, Michael Schmidt, Michael Smart, Scott Stewart, Ernie Torres and John White. White said it was “very different” sitting in the Holiday Inn conference center to be honored instead of fired. He also took a moment to thank Chicago Newspaper Guild and its parent union Communication Workers of America. (CWA). “The Guild has a way of giving us that nutrition when we needed it. All through this whole situation and every situation (the Guild) has kept us in flight with what’s needed at the time,” White said. The Guild continues to fight to restore their jobs. CWA offered Final Cut Pro video software training to all the STM29, not just the ones who were Guild members. “It was bittersweet seeing our brothers and sisters at Friday’s Chicago Journalist Association dinner. Many who came forced themselves to. The doors to the Holiday Inn is also the main entrance to the Sun-Times newsroom. All of the 29 were recognized for their hard work and dedication to their craft and many thanked the Guild for the training. They’ve told me that despite their absence, they are still strong supporters and that makes me feel good because we need them. The struggle has yet to reach its pitch,” Guild President Dave Pollard said. 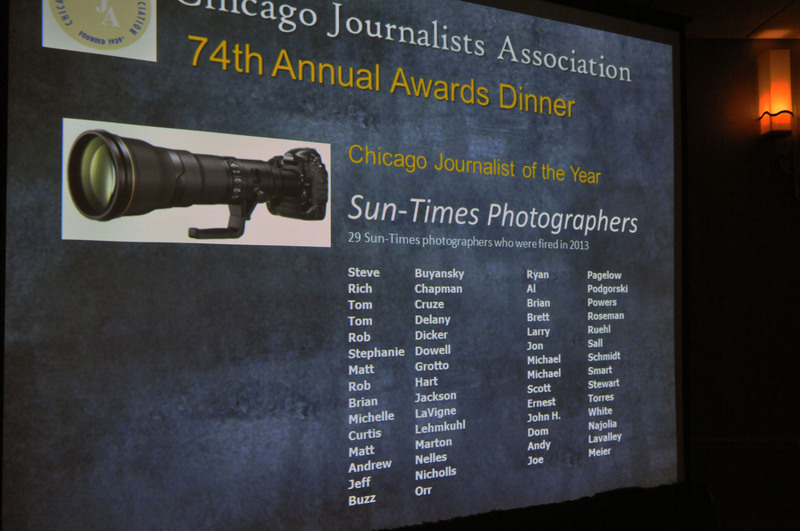 Twelve Chicago Sun-Times reporters also received awards for their work at CJA’s awards dinner Friday, Sept. 27. Sarah Brown Boyden award winners from Sun-Times are as follows: Mark Brown, commentary; Jack Higgins, editorial cartoons; Kim Janssen, features; Frank Main, Km Novak and Dan Mihalopoulos for “Chicago Under Fire” series; Stephanie Zimmerman, business; Dan Mihalopoulos, politics; Tim Novak and Chris Fusco, investigations; Roger Ebert, blog; Monifa Thomas, health; Tim Novak, Chris Fusco, Carol Marin, breaking news; Dave Hoekstra and Jon Sall, online journalism.